The other day, whilst perusing one of my social media feeds, I encountered a promo for an upcoming crowdsourced semi-amateur indy movie. The film in question is an adaptation of a psychotronic comic-tract produced by the mysterious and elusive Jack Chick. 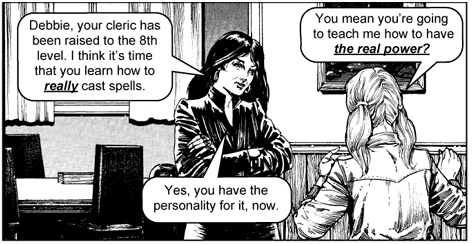 Jack Chick, if you're blessed not to know of him, produces those weird little pamphlets handed out on street corners by Christians who are convinced they are doing evangelism by just giving flyers and odd looks to passers-by. Chick tracts come in comic book form, and garishly represent the wildest and most insanely paranoiac version of Christianity imaginable. Global warming? It's the devil at work. Trick or treating on Halloween? It's the devil at work. Evolution? It's the devil at work. Being a race car driver with an Asian Buddhist wife? It's the devil at work. The film in question is one based on one of his tracts: "Dark Dungeons." That tract was produced in the 1980s, and was an attack on the then-new world of Dungeons and Dragons and role playing gaming. Dice-and-book-games are how we become snared in the occult, it says! These games control and destroy our lives, it says! Those spells are real! Burn your TSR books! Throw away your dice! Give up your satanic obsession and come to Jesus! It's a peculiar tract, particularly if you have any first hand knowledge of the game itself. Role playing gaming is social, pleasant, imaginative, and totally compatible with Christian faith. Evil? Not even vaguely. The film itself is even more peculiar. It's being produced by avid gamers, who find Jack Chick's attacks on their pastime so preposterous and insane that they can't resist the opportunity to make a film out of it. I can't blame them in the slightest. It's a joke, but as they go to great length to explain, it's neither parody or satire. They're just presenting Jack Chick, exactly as Jack Chick presents himself. Which is why Jack Chick has given them the rights to make the movie. It's bizarre. Here you have "evangelists" who know that they are working with people who view them as self-parody. The movie, like the tracts, will just make Christian faith look laughable. And yet...the evangelists don't care. It's hard to know how to process that kind of willful obliviousness. How do you respond to that sort of disconnect from the actual results of an action, without getting your dander up and saying bitter and mean stuff about the creators of these utterly counterproductive tracts? How to be loving, affirmative, and gracious, and yet debunk their dark imagination? It's a struggle, but it's one worth having. Because we do not overcome evil with evil, but with good. We don't overcome hatred with more hatred, but with grace. Sometimes, though, you need to overcome bad crazy with double-extra-good-crazy. It is for that reason, among others, that I have produced what I believe to be the single geekiest book in all of Christendom. I say this with pride in my own geekitude, as an unabashedly and unashamedly geekish pastor who fondly remembers both gaming as a kid, but also gaming with his boys when they were little. The title: Leveling Up: How to be a Christian Cleric. This short tome is a love letter to Advanced Dungeons and Dragons, one that plays around with the conceit that in some odd way, Jack Chick was right. D&D is real. And in that bizarre place where it is real, one can choose to be not just a fighter or a magic user or a thief, but a cleric. And not just any kind of cleric, but a Christian cleric. With spells and all, ones that Christian clerics would use, and that actually kinda work if you think about them in the right way. Being a level eight Presbyterian cleric myself, I'm just the right person to pull that off. If that sounds entertaining, or at least silly, feel free to go to Amazon and snag a copy. The eBook version is no pricier than the Diet Dr. Pepper you'll drink while reading it, although the formatting is a bit squirrelly. I'm still fiddling with that. You're better off with the print version, honestly, though it'll put you back the cost of couple of pints of ale. That a problem? If you're short on silver pieces, just hit me up at belovedspear at gmail dot com, and I'll pitch you a nice clean PDF for free.